As the fall semester begins and students are eager to celebrate and renew friendships, Fresno State’s “Protect Your Dogs Campaign” is under way to increase their awareness of alcohol overdose issues and encourage them to help each other out. The campaign began last fall after Fresno State freshman Philip Dhanens died of alcohol poisoning at an off-campus fraternity house following the end of formal Greek Recruitment Week for new fraternity pledges. 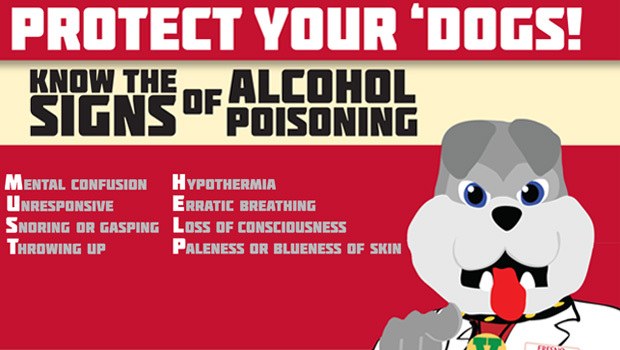 The purpose of the Protect Your Dogs Campaign is to prevent future alcohol overdose incidents among all students by educating them about the signs and how to handle an emergency involving alcohol, said Kathy Yarmo, coordinator of Health Promotion and Wellness Services in the University Health and Psychological Services. “Students will be trained in CPR and information about how to identify signs of an alcohol overdose,” Yarmo said. In addition to its long-standing alcohol awareness programs, the university this year is delaying the Greek-letter organizations recruitment period to ensure students get focused on academics. Fraternity recruitment will start in the sixth week of the semester to allow incoming students time to adjust to their new environment as well as assist them in their time management planning and academic transition. The Greek Recruitment Week delay is supported by the four governing bodies of Greek-letter organizations recognized by the university: the Interfraternity Council (IFC), Panhellenic Association (PHA), United Sorority & Fraternity Council (USFC) and the National Pan-Hellenic Council (NPHC). Traditionally held the first weeks of school, Recruitment Week — formerly referred to as Rush — will now be delayed until Sept.23, said Eddie Dominguez, Greek Life adviser for Fresno State. The university is also requiring all Greek pledges to complete new-member education programs before the start of final exams. Previously there was no time limit, Dominguez said. Dr. Paul Oliaro, vice president for Student Affairs, said these directives will allow incoming students time for academic transition. He commended the Greek leadership for supporting the delayed-recruitment decision. Oliaro said the Greek leadership was very cooperative last year andeffectively managed their events and activities to enhance their community service and philanthropy. He said the delayed recruitment complements the Protect Your Dogs Campaign, which is coordinated through the Drug & Alcohol Awareness & Wellness Guides (DAAWGs) program — a peer education group that operates within the Student Health Center. Each DAAWG member strives to promote safe and responsible usage of alcohol and other drugs through information tables, social norms marketing, National Collegiate Alcohol Awareness Week events in October and the Protect Your Dogs Campaign. The next step in the campaign is the WATCHDOG Program with the Student Health Center training 50 students to become CPR-certified on Sept. 14 and Nov. 2. The trained Watchdogs will get a red watch and t-shirt to identify them at social events. Refrigerator magnets detailing the signs of alcohol poisoning were provided to all new students and will be distributed to others. The university’s Alcohol, Tobacco and Other Drug Safety Council created an ad hoc sub-committee that inventoried alcohol abuse awareness programs and other efforts around alcohol safety and alternative activities that occurred on campus. Nearly 50 academic and non-academic programming efforts were reported. FREAKS is a Department of Public Health-supported program thatprovides students, colleagues and community members the opportunity for fun and safe activities on campus by playing German-style board games. The club meets every Friday night from 5 p.m. to midnight in the University Residence Dining Hall. It has reached more than 550 members since it began four years ago.